On our financial journey, I often get caught up in the little nitty-gritty details: staying within our $300 grocery budget, paying for our gas bill, saving some money on our daughter’s clothes. But if that is all I am thinking about, I forget the big picture. The big picture is those really big goals that will be years down the line, such as retirement, buying a home, and traveling. If I forget about them because I’m focused on here and now, I know that I will be hitting myself later. Have you ever thought, how come so-and-so can travel every year, but we haven't been on a trip since before we had kids? When everyone around you seems to be achieving dreams and reaching goals, you might be barely making it through the day. I've felt like this many times over the last year. My husband just started his own business and we have been living off savings and extra income when we can make it. How I long for the day when we can afford to travel, even if it's just a road trip to the next state over! When you decide to finally sit down and write out your financial goals and then make a plan for achieving them, you will no longer wonder how others are doing it, because you will be doing it yourself! With a little sacrifice and some planning, you can pull off any financial goal you set your mind to. When you are focused on setting money aside for something of value in the future, you will be less likely to spend your money on the little knick knacks and frivolous things you might normally spend it on. Step 1: Write down your goals in order of importance. All of your goals are important, but some are more immediate than others. For example, most financial advisors would suggest that you have an emergency fund and pay off debt before you save for travel. If you have $15,000 in credit card debt and $500 in savings, these would probably be your first goals to work on. For the most part, your child's education and your first house can wait until you have worked on the more important goals of debt and an emergency fund. Step 2: Focus on 1-2 goals at a time. Depending on your income, you should keep the number of goals you are working on to a minimum. If you are on a really tight budget, it might be more practical to set one goal and focus on that until you have reached it. 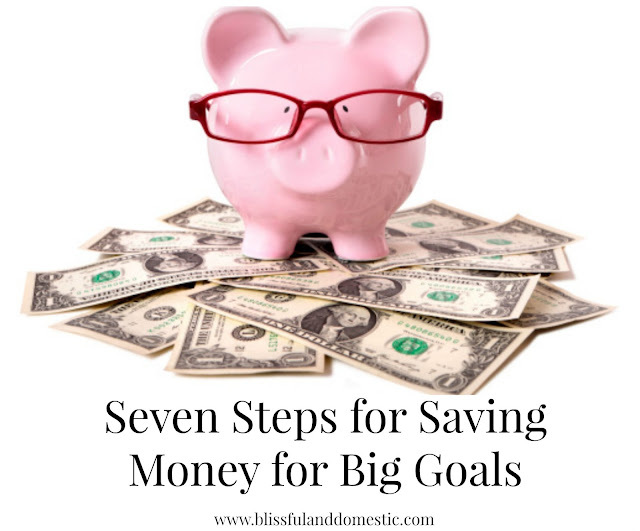 On the other hand, if you make enough money to cover all your bills each month and you have money left to spend, then set two goals to work on. Maybe you've heard that paying yourself first is the best way to save money. But what does that mean? It means that before you pay any of your other bills, you are putting money away in savings for your financial goals. The amount is up to you, but be realistic. If you want to save up $10,000 for a trip to Europe, you might want to put in more than $100 a month so it will take less than 8 years to save for! Let me give you an analogy to help you understand why paying yourself first is best. Currently, I have to do dishes by hand. It seems that the big stuff, like pots, pans, and baking sheets, are often the last things I clean. I focus on the little day-to-day dishes to clean first because they are what we use the most. But then it’s really annoying when I need a pan and it’s waiting to be washed. If I want to continue with my task, I have to stop what I’m doing and wash it. Now wasn’t that inconvenient? It’s the same thing with your financial goals. The big dishes are your financial goals that are often put off because you’re so focused on the small dishes or the day-to-day bills. When you want to take a vacation, and you have been putting off saving for it, you can’t drop everything to go because the money you could have saved for it was spent on something else in the past. That is why it’s best to put the big dishes as a priority each day. Step 4: Be sure to lower your other expenses. Reaching your financial goals can be much easier if you are sacrificing somewhere else in your budget. Perhaps you are saving for retirement. If the minimum amount you'd like to contribute to your retirement account each month is $1,000, you have to take a quick look through your expenses to find things you normally spend your money on and cut back on them or cut them out completely. You might get rid of cable or do your best to meal plan and spend less on food each month. These cutbacks can really add up and help you achieve your goals a lot quicker. Step 5: Try to increase your income if necessary. Now, if you only make enough money each month to pay for your rent, your bills, groceries, gas, insurance, and a few other necessities, it could take a long time to reach your financial goals. In this case, you have to try and increase how much money you make. Consider all your options and decide which one is the most practical for you and your family. Does your husband have a window of opportunity where he could ask for a raise? Or could one of you take on a side job to inflate your income? If you are a stay-at-home mom, maybe what you can do is start your own Etsy shop or go through your basement to find stuff you no longer need that you can sell on Facebook groups, Craigslist, or eBay. Whatever way you can increase income, have a plan for the extra money you bring in. When you make an extra $50 from that antique lamp that has been collecting dust in your basement, put the money directly towards your financial goals and nowhere else. Step 6: Reward yourself for reaching small goals. Sacrificing and working hard can wear you down unless you are rewarding yourself as you go. Let's say your goal for a down payment on a home is $40,000. Each $5,000 you put away for your house, you should splurge and spend $50 doing something your family would love like visiting the zoo or going to a soccer game. It will keep all of you motivated to continue cutting expenses and/or increasing income. Whatever you do, don't wait until you reach that $40,000 goal to really enjoy life. Step 7: Achieve big goals and choose the next goal you should work on. Congratulations, you've reached a big financial goal! It's relieving to finally have all the money you need to fund a specific financial goal. Perhaps your emergency fund goal was $2,000 and you got that all saved up. Now go back to step 1 and see the next goal on your list. If it is still just as important as it was when you wrote it, make a plan to start funding it. But if life has changed and a different goal has become more important, switch the order around. It's never too late to decide on a change in priorities. Going through these seven steps each time you want to reach a financial goal is crucial to your success. Some goals are more attainable than others and may only take months versus years. If your goals are important to you, you will find a way to reach them.